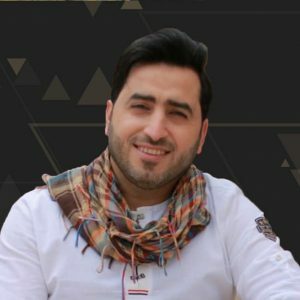 ‏Yahya Hawwa is a Syrian singer and musician whose songs are full of hope and youthfulness with a special message of optimism and nationalism. He received the Oscar award in Cairo songs festival 2009- 2010, His most popular song (Hayati Kulloha le Allah) elevated him worldwide among Arab & Muslim youth. He continued to deliver songs that tackle youth concerns. ‏Yahya Hawwa’s name is popular among Arab youth who considered him for his optimistic personality and songs. He sings for the youth issues and produced special works for human dignity and peace. ‏Yahya participate yearly in tens of events and concerts around the globe in more than 35 countries. ‏Yahya hold a master degree in Psychology. He is very careful when choosing words and melodies for his songs.